Our divine Amish Large Pine Backless Bench brings charm and cottage pine design to your living room, family room, foyer or hallway. 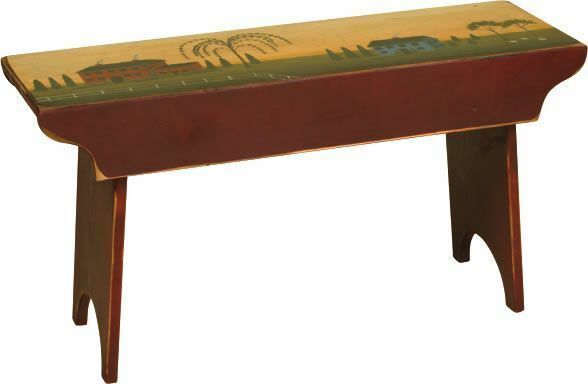 This handy pine bench provides a cozy spot to sit and change shoes, enjoy a picture window view or provide additional seating at family events. Pair this large pine bench with our Amish Pine Wood Shelf with Coat Hooks 50" to complete your cottage style foyer. Don't forget to use this pine bench for photo opportunities. Seat little ones for a cozy picture on any given day! Choose to have this solid pine bench unfinished, stained or painted or choose one of our attractive hand painted designs to draw attention! All of our American made pine furniture is built to last. We offer a low flat rate for shipping your pine furniture. Call one of our Amish Furniture Specialists today at 1-866-272-6773 with any questions.